Swansea Jack was a black retriever born in 1930. He lived in the North Dock / River Tawe area of Swansea with his master, William Thomas. Jack would always respond to cries for help from the water. His first rescue, in June 1931, when he saved a 12 year old boy, went unreported. But a few weeks later, in front of a crowd, Jack rescued a swimmer from the docks. His photograph appeared in the local paper and the local council awarded him a silver collar. Numerous awards followed including ‘Bravest Dog of the Year’ and a silver cup. 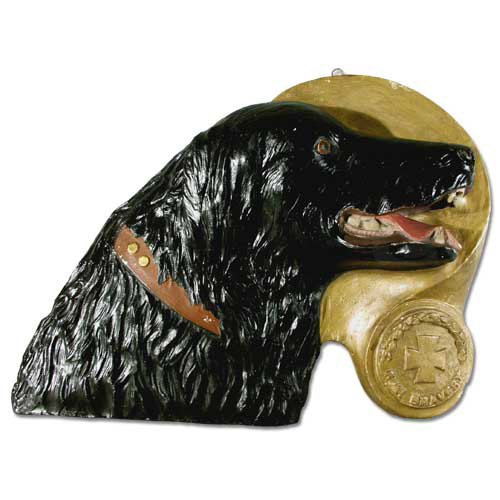 He is the ONLY dog awarded TWO bronze medals (the canine VC) by the National Canine Defence League. Legend has it that Jack saved 27 people in his lifetime. Sadly, in 1937, he died after eating rat poison. His publicly-funded memorial stands on the Promenade near St.Helen’s Rugby Ground. In 2000, Swansea Jack was named ‘Dog of the Century’ by NewFound Friends of Bristol who train domestic dogs in aquatic rescue techniques. Jack may have lent his name to the nickname for local people – Swansea Jacks.